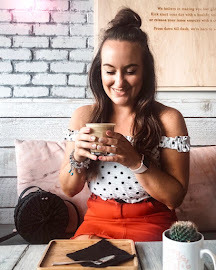 When heading down to London, I knew that visiting the Sky Garden was top of my priorities, I'd heard so much about it and plus I knew it was going to be totally instgrammable and perfect for blogging - obvious top priorities too! We visited on a cold but clear day ready for our timed slot at 11am and were led straight into the lift and up to the top floor. Once we got up there I was amazed by the view that we could see, we were very lucky it was such a clear day as we could see so much of London and some amazing monuments. The Sky Garden is so spacious and airy with 360 degree views of the capital, you could walk around at your leisure which I loved as I took the opportunity to take as many photos as possible as well some outfit photos which you can see in this post. I would highly recommend taking a visit to the Sky Garden next time you're in London as it is so brilliant to see London from a different perspective (I love seeing cities from above) and to top it all off, it's completely free - how many tourist locations nowadays can you say are free? Well worth a trip, eve if it is just for the instagram photo! Have you ever visited the Sky Garden?